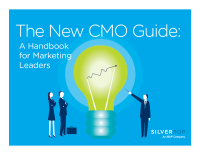 It looks at what new marketing leaders need to know in order to best assess, understand and address their business’s marketing opportunities and challenges. The CMO now comes second only to the CFO in terms of the influence he or she exerts on the CEO. Marketing leaders are in an excellent position to truly impact the destiny and direction of their companies. Develop the important year-one game plan.